I love video games. There, I’ll just come out and say it. Yeah, it’s not particularly strange this day and age that a 31-year old still boots up a gaming console here and there, but it wasn’t that long ago that anyone over the age of 18 would readily admit that. By now, everyone under 40 – heck maybe everyone under 50 – has at least some familiarity with video game consoles. I grew up with the Nintendo Entertainment System and added a Super Nintendo, Sega Saturn, Sony Playstation, Sega Dreamc…well, you get the idea. The Atari 2600 ushered in an era of home gaming in 1977 that still exists today, now far more robust and mainstream than ever before. Even for a few years before then, dedicated units that could turn your little black-and-white box into a Pong arcade cabinet had been on the market. Home video gaming, as we know it, has been around at least 40 years now. I don’t game as much as I used to. Despite placing a preorder for the upcoming PS4, I’m limited in play time and dollars for today’s big budget titles (I’d prefer to use my precious free time and money on travel, obviously). My favorite games are EA’s FIFA soccer titles, which I’ve grown quite good at. Back in the day, though, I played anything and everything. 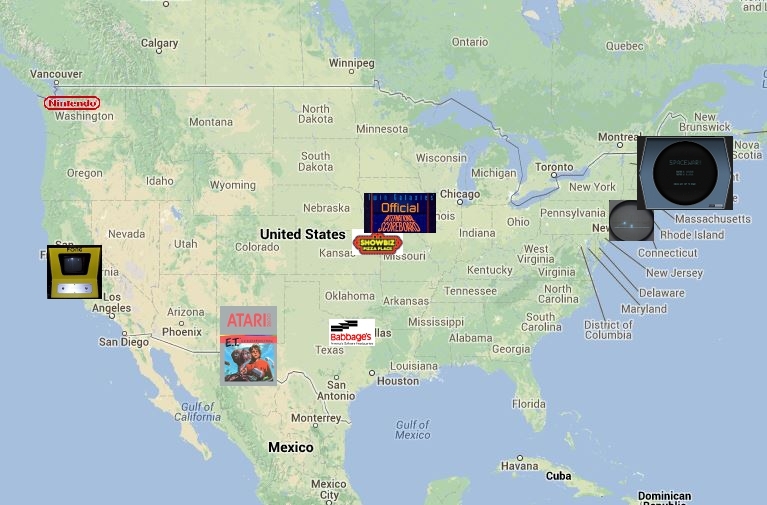 The other day I was dabbling through some articles on the history of gaming and thinking how great it would be to assemble a little guide to video game-inspired “historic sites” that would make for great stopovers for the gaming fan on a road trip. You rarely see the topics of travel and gaming intertwined, the two seem mutually exclusive of each other. Gamers are often unfairly labeled as basement dwellers that never get out, while travelers are more often interested in getting out and experiencing “real” culture, as opposed to some fantasy world in a video game. Either way, for those few that enjoy both, I hope this little write-up can bridge the gap between these two passions. Where do we start on our gaming roadtrip? Japan? OK, for this article I’m actually going to exclude our friends across the Pacific. Japan is a gaming mecca all its own and could easily dominate this feature. I’m going to hold off and keep this North American-centric and sensible for road trips originating here. Our first stop on this trip takes us to the Brookhaven National Laboratory in Upton, New York – part of Long Island. Here, in 1958, physicist William Higinbotham created Tennis for Two, essentially the precursor to Pong. Higinbotham was actually looking to cure boredom for visitors to the Laboratory, yet his little oscilloscope-powered creation stamped his name forever in the annals of gaming history. Fifty years later, in 2008, the Lab welcomed the public back for an anniversary showcase where one could try their luck at this “ancient” game. Today visits to Brookhaven are somewhat guarded and public is only allowed through an official invitation or an announced public event – though there seem to be quite a few offerings if you’re interested. In many gamers minds, Tennis for Two acts as sort of a pre-pioneer. For many aficionados, Spacewar should be considered the first “computer game”. Spacewar was forged at the Massachusetts Institute of Technology (MIT) in Cambridge, Mass. The game was powered by a computer known as the TX-0 – a heavy “supercomputer” that actually had been churning out simple game programs (like tic-tac-toe) for a couple years before Spacewar in 1962. Spacewar was the brainchild of the “Hingham Institute”, which was nothing more than a rental on Hingham Street in Cambridge, housing the few braniacs who conceived the space shooter. Spacewar was essentially a two-person “dogfight” that involved two spaceships trying to shoot each other in a rather realistically portrayed star field based on star maps. MIT is an easy visit – it’s one of the most hallowed institutes in the U.S. – but you’d probably want a few specifics to work with. The current location of the Electrical Engineering Department seems to be the picturesque Stata Center – which opened in 2004. I have no idea if the infamous “kludge room” that housed the TX-0 still exists – but feel free to fill me in. Hingham Street, though, does still exist, but I am unsure of the exact location of the apparently “very dingy tenement” that these brilliant minds rented out. Below is the street view of Hingham, but it’s likely the original apartment was renovated or leveled for a new construction. From New Hampshire we go cross-country to Sunnyvale, California. Nolan Bushnell, who founded Atari and the Chuck E. Cheese pizza restaurants, was testing out a Pong unit that would launch Atari into the public eye. The story begins one way or the other at Andy Capp’s Tavern in Sunnyvale. Their are conflicting accounts of the “creation” story for Atari, which you can read about here. I’m mostly interested in the “where” – can you still visit Andy Capp’s today? Well, what seems to becoming a common theme, you can visit the location of the tavern but the property ownership (and name) has changed. The building now houses a comedy club called Rooster T Feathers and the website hardly acknowledges its video arcade roots (despite its own history going back to 1979, abutting closely with the demise of Andy Capp’s which apparently closed in 1975. Bushnell was likely inspired by his work at Lagoon Amusement Park as a high schooler in Utah. Lagoon, which is based in Farmington, Utah, has been around since 1886 and houses the sixth oldest roller coaster in the world. Bushnell dabbled in video games while working at Ampex in the late 60s, a Silicon Valley company that was pumping out eight-track players at the time. Ampex still exists today as a digital storage and recording company. While Pong may have lifted Atari into the stratosphere, it is Computer Space that is widely known as the first manufactured arcade game. Computer Space was highly influenced by Spacewar and Bushnell saw potential in bringing the space shooter to the masses. Bushnell was also inspired by his “competition”. Bill Pitts (a recent Stanford alum) and friend Hugh Tuck released Galaxy Game, which debuted at Tressider Memorial Union – the student union building at Stanford University which still stands today (and looks every bit the early 60’s architectural creation) – in 1971. You can read more about the history of Pitts and his game here. The problem with Galaxy Game was the sheer cost of production (reportedly upwards of $20,000). Bushnell and his partners at Nutting Associates (a coin-op company that existed in Mountain View, California – a recent picture of the location can be found here) sought to streamline the costs and get Computer Space out to as many locations as possible. The first test location you ask? A restaurant called Dutch Goose in Palo Alto, California which still exists today (and even has some old arcade games standing around – though Computer Space isn’t one of them)! This makes Silicon Valley a great destination for those interested in the very earliest roots of Arcade gaming. The Dutch Goose and Stanford University are within walking distance of each other and a short drive to Sunnyvale and the Rooster T Feathers comedy club make this an easy day trip itinerary. The locations of the first Chuck E. Cheese Restaurant (San Jose, California), Showbiz Pizza (Kansas City, Missouri) and Dave & Busters (Dallas, Texas). None of them still house the original businesses. Funspot Arcade, the self-proclaimed largest arcade in the world housing over 500 machines and has been in business since the 1950’s. The arcade is located in Laconia, New Hampshire and is about an hour and a half drive north from the old location of Sanders Associates (not listed on Patterson’s site). The Spot in Renton, Washington, the location (and still operating) of the first Donkey Kong test machines. The first Babbage’s Store (Dallas, Texas). The Babbage’s brand came to include Software, Etc., Funcoland, and EB Games and has evolved into gaming retail giant Gamestop. The Alamogordo Landfill where thousands of unsold Atari games, including the notorious E.T., were dumped in the early 80s. Ottumwa, Iowa, the “video game capital of the world” and home of Walter Day’s Twin Galaxies. The arbiter of old-school gaming records, Day and Co. helped launch the career of storied Donkey Kong player Billy Mitchell. This story is featured prominently in the 2007 documentary, The King of Kong: A Fistful of Quarters. Little known fact: I was listed in the first edition of Day’s video game record book that released in 1998. When Nintendo Power called upon readers to submit high scores for Madden NFL ’96 – I jumped at the chance. While running up ridiculous numbers while playing a two-player game by myself, I set some pretty dubious records (namely, some nearly 5,000 yards passing in a single game). What stood out was the longest field goal kick record. Using the All-Madden team, I devised a strategy that kicked the ball into a wind gusting heavily to the left (and behind me) and kicking it slightly to the right. I kept maxing out at a 60-yard field goal – but felt a 61-yarder was possible. Finally, I managed to get the ball to just hook inside the goalpost from 61 yards out. I knew my effort was unbeatable, that nobody thought of my strategy to gain that extra yard from utilizing right to left wind (directly straight on wind wasn’t good enough). A few months later Nintendo Power published the Madden NFL ’96 records. I couldn’t believe it, my records were all over the Power Players charts! And there it was, No. 1 longest field goal, beating out another couple of 60-yard makes. I did it! I was going to have bragging rights among all my friends! A couple years later I learned of Walter Day’s book when my mom got a call from the local news station. A press release came out announcing Montana video game record holders – and I was on it. Apparently Twin Galaxies culled a bunch of console gaming records from these old Nintendo Power issues. So what became an afterthought all of sudden launched me into local stardom with a (somewhat embarrasing) three-minute news segment. This puff piece earned me a lot of “I saw you on the news!” the next few days, and also a few teases, as, according to the broadcast, I was now more interested in “girls than in games” (despite never saying that). Well, little did they know what I would have given to actually ask a girl out at that time in my life. At 16 I was too shy and too nervous and could barely bring myself to talk to girls, let alone hang out with them. In reality, video games probably still held more importance to me at that time. Thankfully, I overcame that shyness, and gaming took it’s proper place in my current life, but it’s all too funny to look back now on that moment in time.